The north end of Thong Lor (Sukhumvit Soi 55) gets really backed up with traffic, especially on weekend afternoons. Lots of shoppers going to lots of shops and sometimes you end up sitting for several minutes. Yes, these moments of stuck traffic give me amazing opportunities to really see this fascinating neighborhood in which I live. The street is about 3 km (2 miles) long with a Skytrain station at the south end. There is a special transit system, a fleet of aging Mercedes Benz busses that spew coarse black smoke, that run up and down the soi, picking up riders at the Skytrain station, several stops along the way, until terminating at the khlong (canal) pier on the north end of the street. These bright red unairconditioned busses park at the north end of the street when they are not in use. 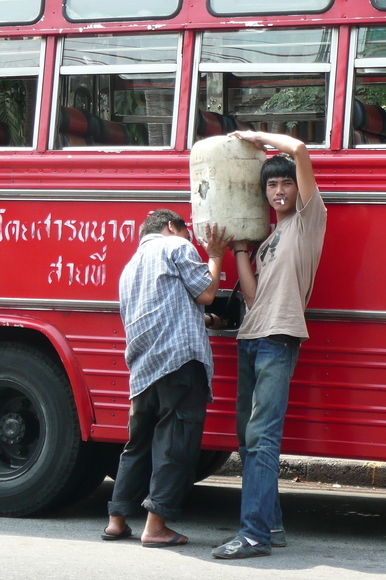 While sitting in traffic, I watched as two men refueled one of the buses in the most ad-hoc manner: gravity-fed through a rubber hose connected to a plastic fuel jug. The color and the composition both spoke to me but I was equally fascinated that the younger man was smoking while doing this. I wondered if I kept the camera ready, would I be able to capture a good picture of the explosion without losing my life in the process? I never found out as traffic started moving and there was, to the best of my knowledge, no explosion. 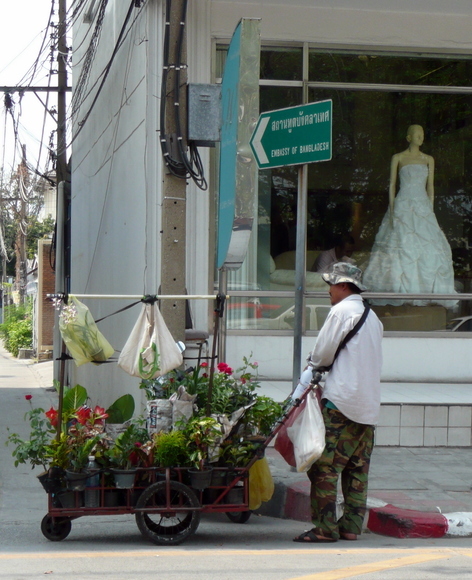 Also along the street, which is known for its abundance of wedding boutiques, I saw a plant vendor pause in the shade in front of a window displaying a wedding gown. Again, a wonderful contrast that exemplifies this neighborhood: it is called the Beverly Hills of Bangkok, but at the same time all segments of the socioeconomic spectrum are represented here, both living and working. That is something I really like about Krungthep: there is a huge gap between the haves and have-nots, but the gap isn’t physical. and had two hours to kill before our driver was schedule to arrive. Not wanting to get sweaty again and a bit hungry from our explorations that morning, we walked back to the Pavilion mall. Here is the outdoor dining area that I was talking about – “the catwalk” along which people stroll or sit and sip coffee, to see and be seen. 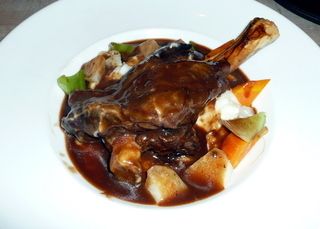 Ignoring all our Lonely Planet sensibilities – local food only! 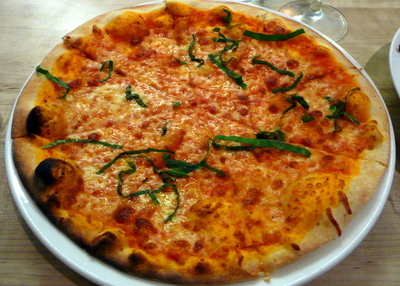 – we stopped at an Italian restaurant along the catwalk called, originally enough, Michelangelo’s. They had a reasonably priced set lunch and since our flight wouldn’t put us back into Krungthep until after dinnertime, a late lunch seemed reasonable. 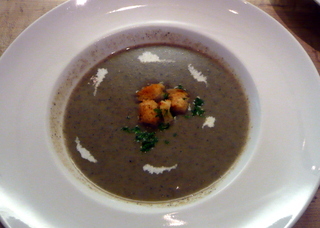 Mushroom soup for me, Caesar salad for Tawn. A simple pizza to share. 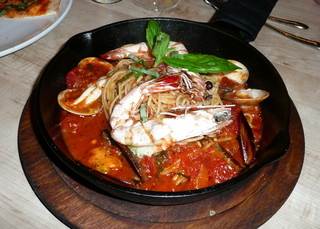 A seafood pasta dish for Tawn (sorry for the lousy exposure) and a hearty ossobuco for me. After some coffee, a short walk back to the hotel as the first drops of afternoon rain started to fall. 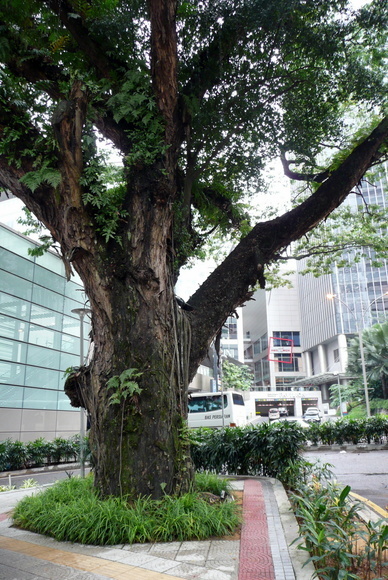 Below, the thing I like best about KL: beautiful old trees shading the sidewalks. 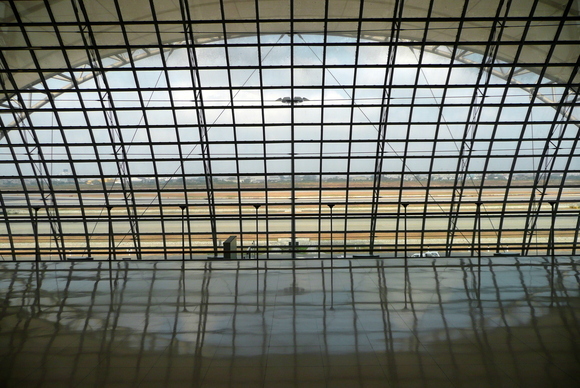 We made good time to the new Kuala Lumpur International Airport, a gorgeous white elephant an hour south of town. 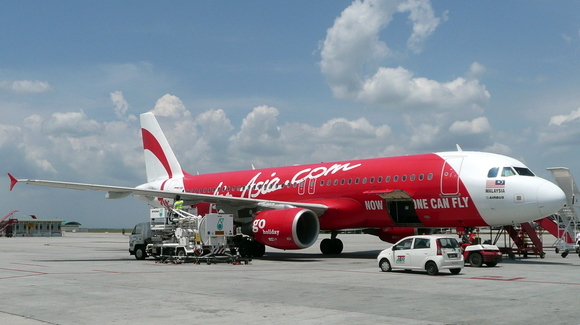 Air Asia flies from the cheapskate… er, low-cost, terminal which is an additional 20 km drive from the main terminal. Upon checking in we dealt with the challenge of explaining to the agent that while we had paid to reserve a seat (something new for Air Asia), we would like to pay the difference to the higher fee to reserve an exit row seat (250 baht versus 50 baht). She didn’t understand what we wanted to do, so we ended up sitting in our original seats. Not too bad, but legroom is tight so a few extra centimeters would have been appreciated. 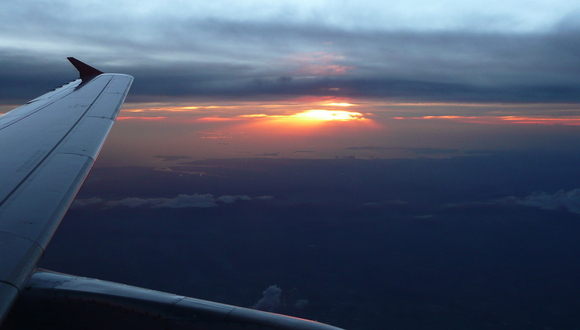 Smooth flight back to the Big Mango as we watched a beautiful sunset over the Andaman Sea. Good to be back home. I manage to make a three-day trip to KL seem like a month, don’t I? Here’s our final day in KL. We decided to actually get a little bit of sightseeing in, since Pong had driven us around the evening before and we had a better idea of how the city was laid out. From there we took the monorail several stops south into the city. This is a good way to see the city as it is elevated and views are largely unobstructed. We alighted at the Majarajalela station (I’m sure I mispronounced that when buying the tickets, but we got there alright) and then walked into Chinatown. First we stopped at the Chan See Shu Yuen temple, which is a Chinese clan association building for, I assume, the Chan family. 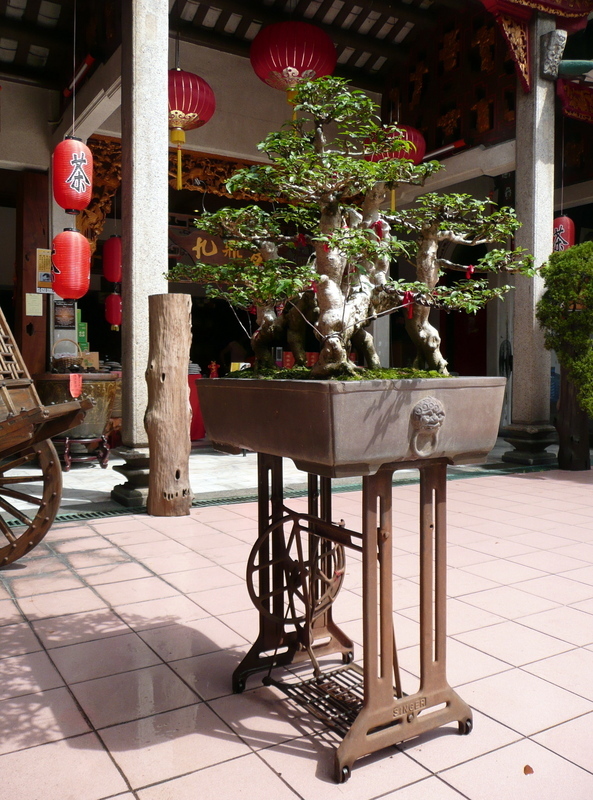 Pretty building with a fascinating bonzai tree in the courtyard, which sits upon an old Singer sewing machine base. 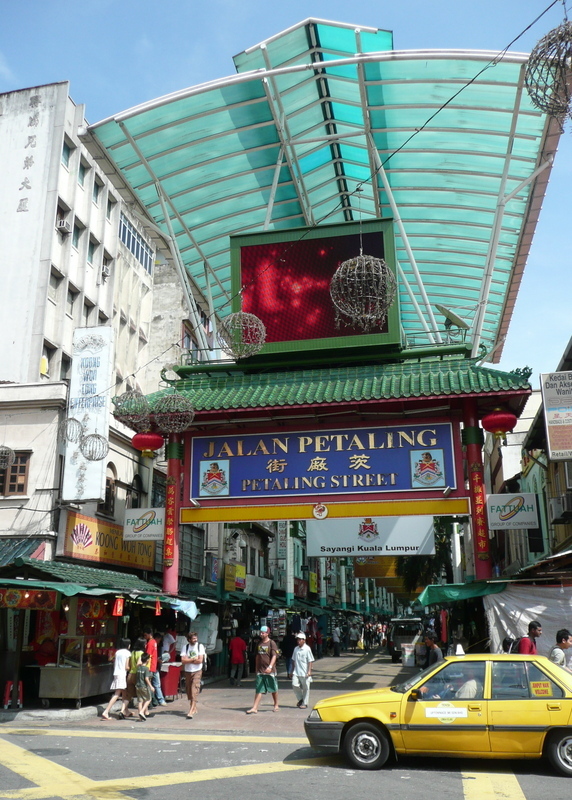 Continuing north a few blocks past the old chophouses, we arrived at Jalan Petaling, a covered street that looks a little like the Fremont Street Experience in Las Vegas, minus the LED light display. The vendors and shops had the typical collection of things that you find everywhere in Asia. We continued west along Jalan Hang Lekir, passing a few interesting boutiques including one called Peter Hoe, which offers textiles, home decor, and a nice selection of batik on the corner of Jalan Hang Lekir and Jalan Hang Kasturi. Cute place, worth a visit. We stopped by the General Post Office which, according to my little guide, was open on Sundays. Unfortunately, it isn’t. So I returned home with stampless postcards and will have to mail them (once written) and some extra ringgit, to Andrew in Penang and ask him to post the cards for me. This section of town, near Independence Square or Dataran Merdeka) has some fantastic examples of Islamic architecture, both in traditional forms as well as more modern ones. Above, the dome of the Textile Museum is washed, its stripes reminiscent of the duomo in Siena, Italy. In the background is (what I understand to be) a former government building, although the government has relocated itself to a new city 30km south of KL, near the new airport. What is fascinating is how the more modern building’s screens echo the lines in the older, more traditional building. 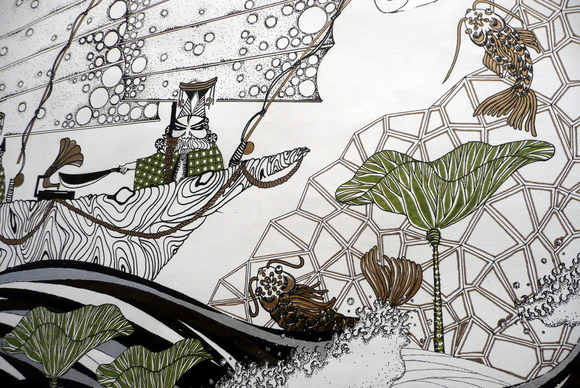 These are motifs that are reflected again and again throughout the city. 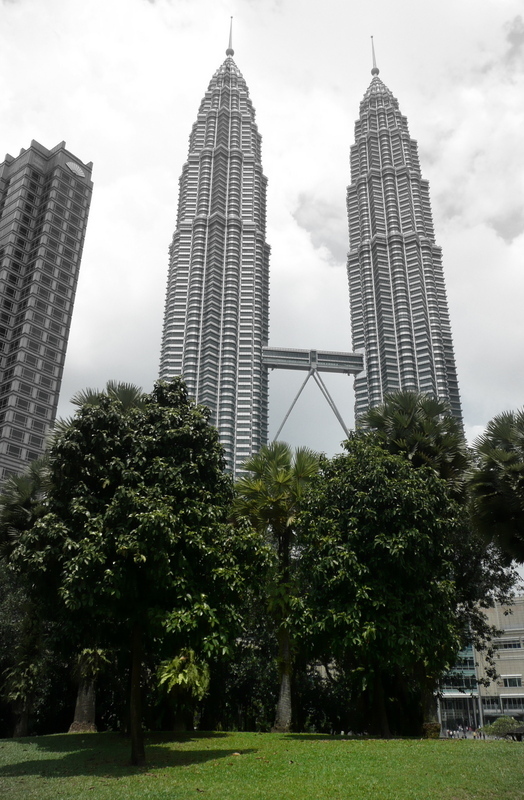 We walked a bit further before catching the subway three stops to the KL City Centre area, home of the Petronas Towers. No longer the tallest buildings in the world, they are still very impressive, especially at night. I had initially hesitated to come see the towers, even though Ken had told me there was a park at the base of them. For some reason I thought the space would be tacky but, other than the high-end mall incorporated into the base of the tower, the park is actually very nice and there are some great areas to sit in the shade, enjoy the fountains and take in the view. We were quite sweaty by this point so returned to the hotel to freshen up before our 2:00 check-out. Tomorrow, I’ll conclude our visit. 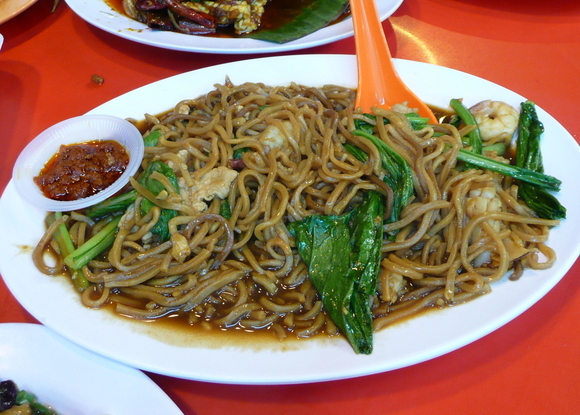 For most of our trip to KL we ate, hung out at cafes and generally avoided the touristy must-see places. Had we done this in Krungthep, we’d think of ourselves as wasting away our time. But since we were on holiday in another city, it was quite alright. Very close to our hotel was the Pavilion Mall. 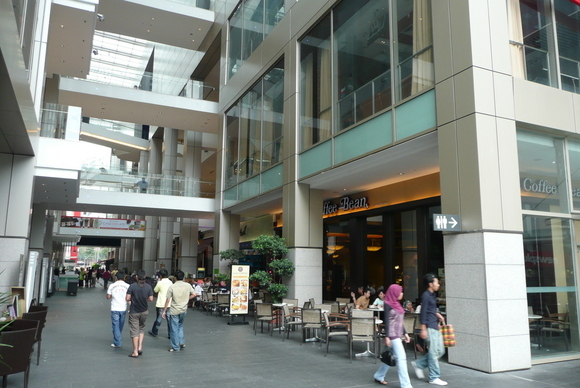 This very large, very high-end mall is equivalent to Paragon in Krungthep except that it has a very nice open-air space that is lines with restaurants and cafes. Lots of outdoor seating and – I swear! – the largest concentration of gay men I’ve seen anywhere in Southeast Asia. The area is apparently nicknamed “The Catwalk” for reasons that quickly become obvious. Outdoor dining is something largely missing in Krungthep, especially middle- and upper-tier restaurants. Streetside noodle vendors are a baht a dozen, of course. There was a nice Illy “Espressamente” Cafe situated at the end of the catwalk. 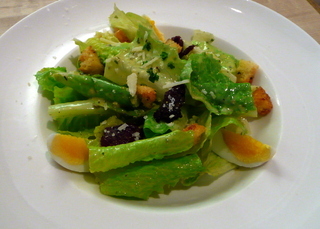 The menu included a wide range of little bites from panini to olives to cheeses. From upper left, clockwise: olives, air-cured beef, and fresh cheese served with toasts; “arancita” fried rice ball with beef inside; a latte made with heart; grilled panini sandwich. In the afternoon, we went to Central Market, a restored two-story market with many small vendors selling trinkets and souvenirs, some very local and others looking like the same things you can find at any market in Asia. Next door were some art galleries so we stopped in to see an exhibit. 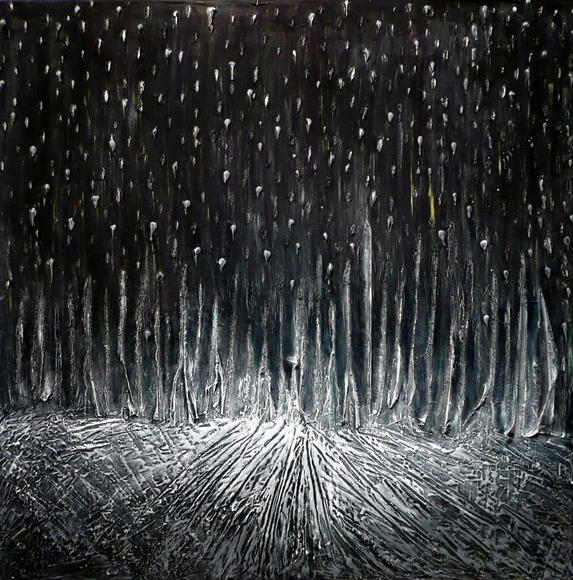 Below, Icsse KHOR Chin Tin’s “Snow Falls in Malaysia? 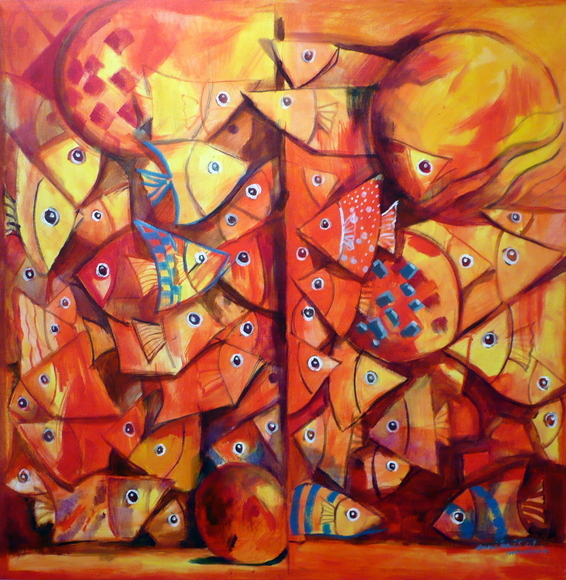 Who Knows?” – mixed media on canvas. 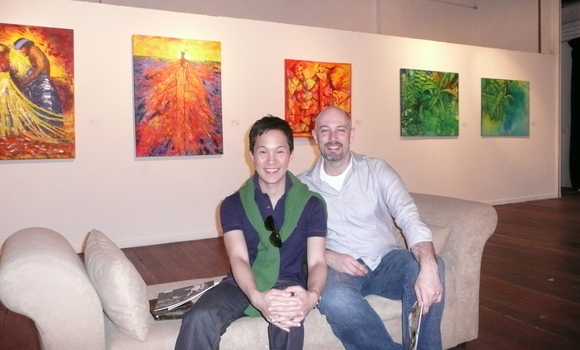 Many thanks to Pong, Otto and Han’s friend, who introduced us to the gallery. This trip hasn’t included a lot of sight seeing. And we realized after the fact that we know a number of people here whom we forgot were here. So apologies to those we didn’t see on this trip. 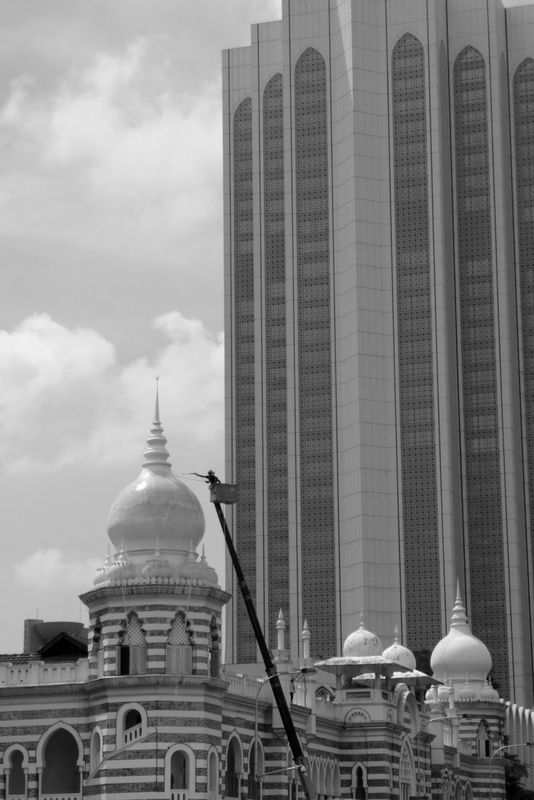 We’ll be back, though, as KL seems a comfortable and laid-back city, even if there aren’t a lot of must-see sights. First off, the view from the hotel room. We could see one half of one of the two Petronas Towers. The view itself isn’t super impressive. But the towers are and they really are amazing at night, visible from all over the city, popping up in the background when you least expect them. 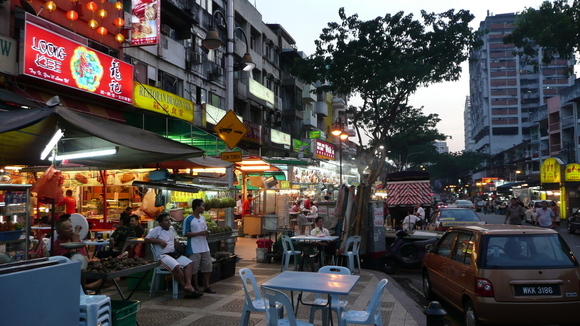 On the advice of some of Tawn’s KL office colleagues, we ventured over to Jalan Alor (jalan = street), a long block of hawker centers and open-air restaurants that cover a wide range of ingredients and styles of cooking. In front of each restaurant are touts, holding menus and assertively selling you on why their restaurant is the place you should eat. Not unlike the touts you would expect to find in a red light district which, we discovered, is nearby. After walking nearly the whole length of the street, we ran the gauntlet back to the beginning, settling on one of the first places we saw. There was a large selection of individual vendors, so we felt like the variety would be very good. We ordered a lot of food, too much for two people, and ate well. 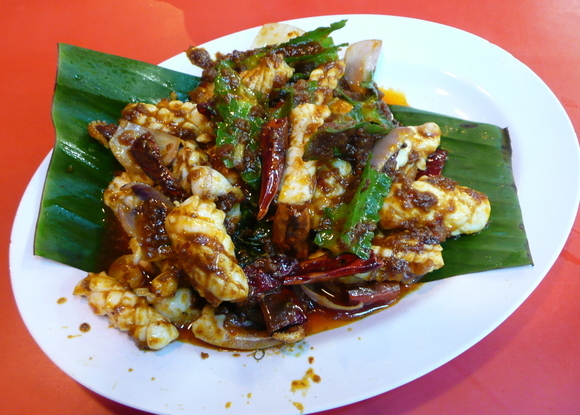 Spicy squid served in a chili sauce. Not so spicy as to be intolerable, but with a nice kick. 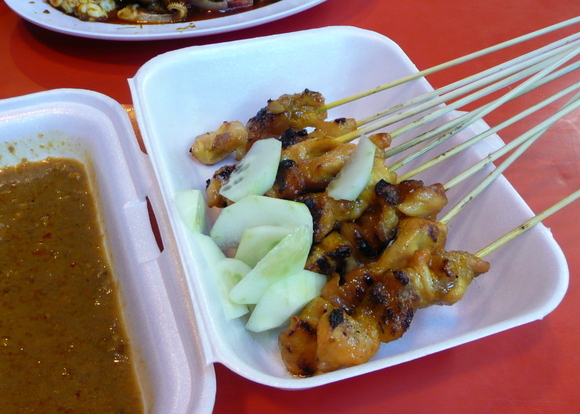 Chicken satay with a tasty fresh peanut sauce. Juicy meat with a nice smoky flavor. 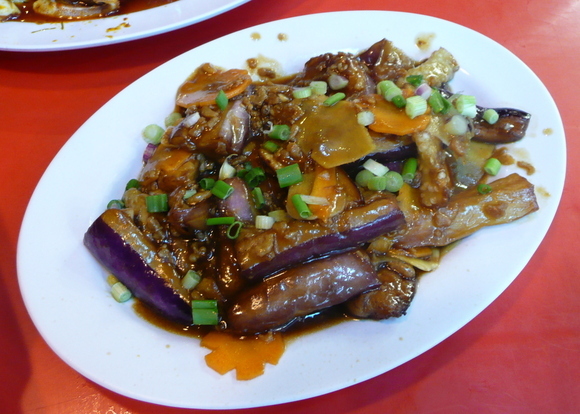 Eggplant stir fried with ginger. 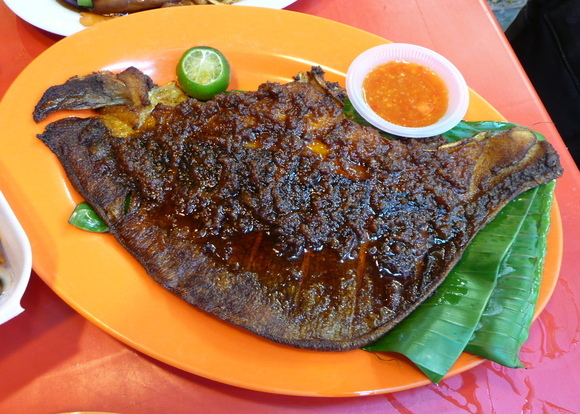 Skate wing fried in banana leaf, served with lime and chili sauce. Never had skate wing before. Interesting texture as, like shark, there’s a lot of cartilage. Fried noodles with seafood and veggies. We could have lived without this just because we already had so much food. By the time we finished, the sun had set and the streets were filling with people. On the way back to the hotel we stopped at a cinema to see what was playing, ending up watching Slumdog Millionaire, which has yet to open in Krungthep. Very nice film, well made. I headed down to Kuala Lumpur today, and easy flight at just over two hours long. Tawn will join me Friday and we’ll spend the weekend here. I took Air Asia for the flight, the “Southwest Airlines” of Southeast Asia. 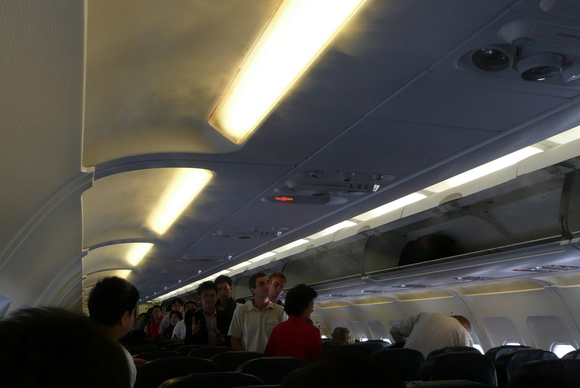 I’m not a big fan of the airline: 29″ pitch is a bit tight for me (I’m 6′ tall) even if the flight is only a few hours. But the price can’t be argued with: 4300 baht including taxes versus 6900 baht on Malaysia and 10000+ baht on THAI. I don’t want to contribute to this race to the bottom by flying based on price alone, but a 50% premium isn’t justifiable for two or three more inches of leg room for two hours. It was a very humid day in Krungthep and while boarding, the air conditioned air was condensing inside the cabin, creating a fog-like effect that was really funny. You felt like you were walking through clouds just to get to your seat! The picture doesn’t do it justice, though. Please view the video below for the full effect. While waiting to push back, an Aeroflot IL-96 pulled up alongside us. 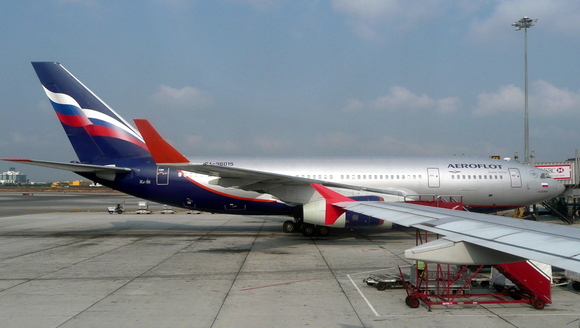 Aeroflot is the remnant of the U.S.S.R.’s sole carrier and the IL-96 was the last Russian-built plane they added to their fleet. In years since, they have bought aircraft from Boeing and Airbus. The 96 is an interesting bird: not a very long fuselage but huge wings. It is designed to fly long routes with medium passenger loads, although it not the most fuel-efficient plane out there. Arriving in KL at the Low Cost Carrier Terminal, I was struck by how much outdoor walking they have you do. All covered walkways, but it was quite a hike to get to the terminal. Along the way, beautiful views of the airplanes. Of course, they are all Air Asia planes so it gets boring real fast. 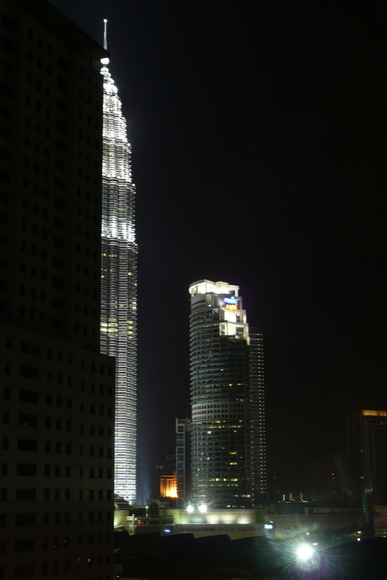 I’m staying at the Novotel in central KL, quite close to the Petronas Towers. In fact, I can see one (vertical) half of one of the towers from my room. I can’t wait to show Tawn! The area nearby the hotel is quite a popular stretch. 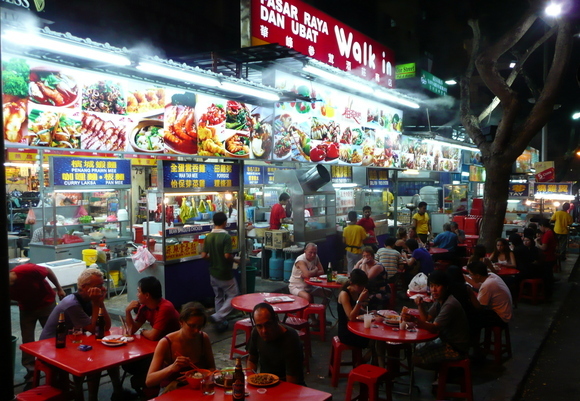 Lots of outdoor seating at restaurants and cafes for cuisine from around the world. Very nice, actually. I don’t understand why Krungthep doesn’t have anything like this? 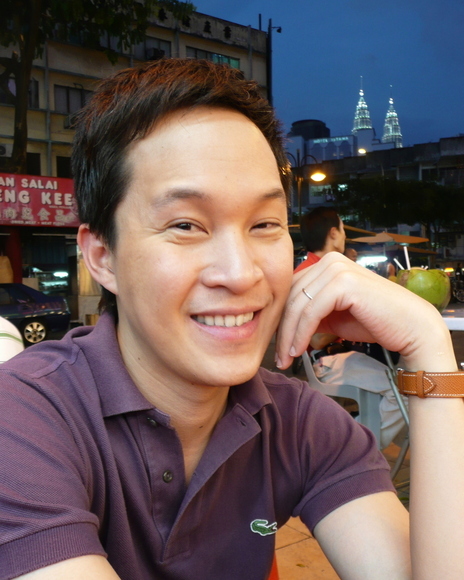 KL is very similar weather to Thailand, so that’s no excuse for not having outdoor seating. The longer I stay here, the more aware I become of the changing seasons. This requires a much higher level of attention because the changes are more subtle than in regions further from the equator. 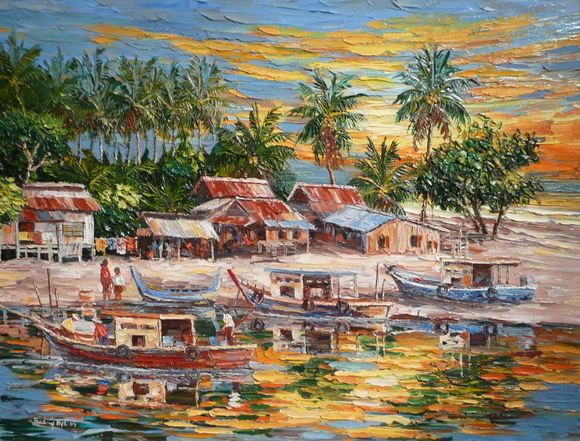 Expats in Thailand often jokingly refer to the three Thai seasons as “hot,” “hotter” and ‘damn hot”. This year we enjoyed the coolest winter in a decade and so the transition into ruuduu rone, literally “hot season”, is more pronounced than in the past few years. 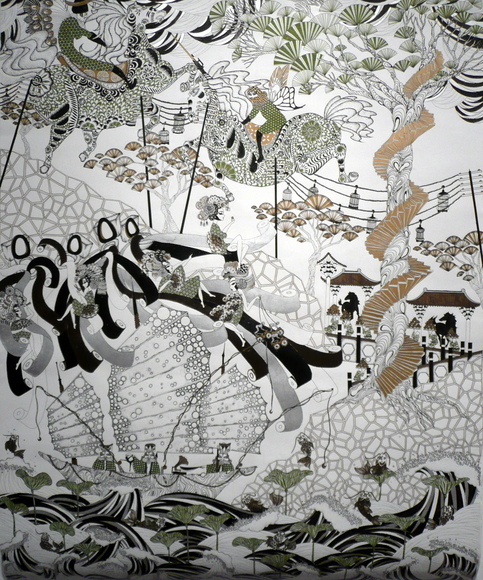 Likewise, the springtime burst of blossoms is more noticeable, too. Above is an example of dtonmai chompoo pantip. They are everywhere in Krungthep this week. While less delicate and refined than the Japanese sakura (flowering cherry trees) that blossom each March and April in the land of the rising sun, these Thai sakura give us a week or two of beautiful and festive color. 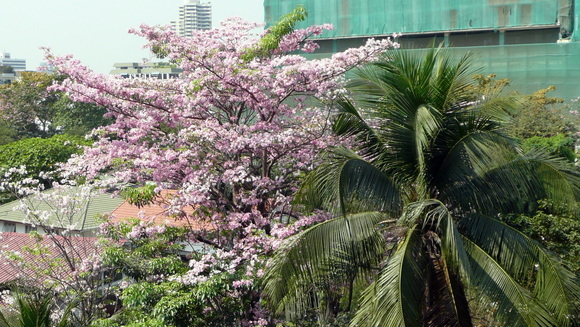 Our soi is littered with pink blossoms. In other news, we have a neighbor somewhere in our condo complex – a few stories above us, I think – who seems to really like stinky tofu. Once or twice a day they start frying it up, turning on their kitchen fan to vent the smell, which then pushes it into our kitchen. To say that it is overpowering is an understatement. While I appreciate that everyone has a different sense of taste and I don’t claim to the be arbiter of what should and should not be prepared, every day is a bit much. Tawn has climbed the stairs to try to figure out who the offender is. But the problem is, since the smell is vented into a central air shaft, you can’t smell it out by the front doors of the units. So the mystery remains. Might be time to go talk to building management and have them post a “no durian or stinky tofu” memo. Tawn and I are off to Kuala Lumpur this weekend for a few days, our first time. May not have a lot of entries over the next few days but I’ll update as soon as I can.